Beloved and award-winning author M.T. 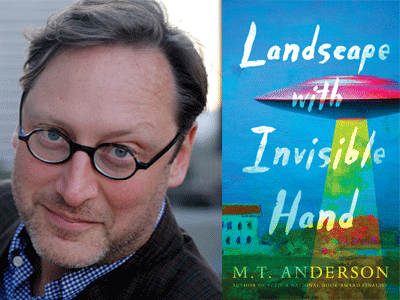 Anderson joins Not Your Mother's Book Club and the San Francisco Public Library in celebration of his newest YA novel, Landscape with Invisible Hand! Called "an elegant, biting, and hilarious social satire that will appeal to dissatisfied, worried readers of all ages" by Booklist, M.T. Anderson's new novel is a sharply wrought satire of art and truth in the midst of colonization. A portion of sales made during this event will benefit our friends at the San Francisco Public Library's new teen center, The Mix. About Landscape with Invisible Hand: When the vuvv first landed, it came as a surprise to aspiring artist Adam and the rest of planet Earth -- but not necessarily an unwelcome one. Can it really be called an invasion when the vuvv generously offered free advanced technology and cures for every illness imaginable? As it turns out, yes. With his parents' jobs replaced by alien tech and no money for food, clean water, or the vuvv's miraculous medicine, Adam and his girlfriend, Chloe, have to get creative to survive. And since the vuvv crave anything they deem "classic" Earth culture (doo-wop music, still-life paintings of fruit, true love), recording 1950s-style dates for the vuvv to watch in a pay-per-minute format seems like a brilliant idea. But it's hard for Adam and Chloe to sell true love when they hate each other more with every passing episode. Soon enough, Adam must decide how far he's willing to go -- and what he's willing to sacrifice -- to give the vuvv what they want.